With equities seeing some very significant weakness, the VIX opened in the mid 16s, and built gains across the day, settling +25.5% @ 19.14. Near term outlook is for an equity bounce, which should equate to VIX cooling to the 15/14s by next Tuesday. 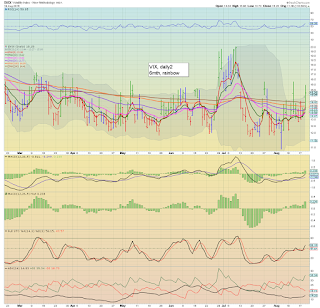 Suffice to say, VIX 19s are still relatively low. 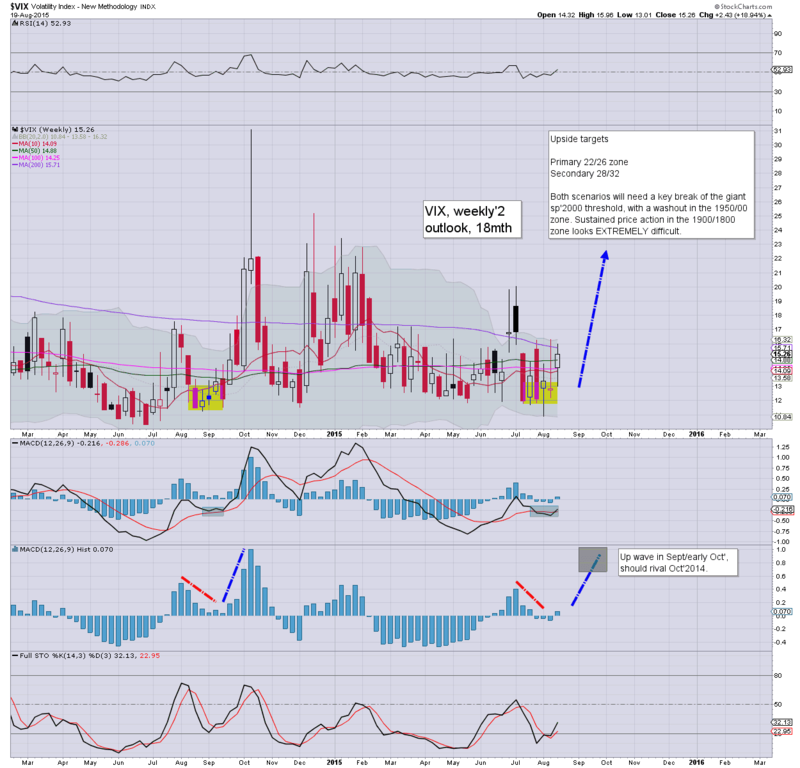 The big VIX 20 threshold looks out of range in the immediate term. Best guess.. VIX to cool to the 15/14s early next week.. before a break into the low 20s by end month/early Sept'. US equities closed significantly lower, sp -43pts @ 2035. The two leaders - Trans/R2K, both settled lower by -2.5%. Near term outlook offers a short term floor, with a probable bounce to the 2075/80 zone by next Tuesday... which should equate to VIX cooling to the 15/14s. *closing hour.. moderate chop, a failed attempt to rally, but then breaking marginal new lows into the close. Ohh noes.. Dow loses 17000 into the close..... pretty nasty. So... quite a day... but on any fair basis, nothing for any of the bears to get overly hysterical about. We've held most of the broad supports, and VIX remains 'relatively' low in the upper teens. Best guess.. a 2-3 day bounce... 2075/80 (I suppose 2100 is possible, but it looks difficult).. and then the next wave should take us to sp'2000/1975 zone... with VIX blasting into the mid 20s. Having dropped AAPL-short and VIX-long shortly after the open, I am back on the sidelines, with no intention to get involved again until next Mon/Tuesday. The market has seen another micro wave lower to sp'2042, with Dow 17041. Things are clearly 'on the edge' here, as the sp' has taken out the July 8'th low. VIX is +19% in the 18.10s. 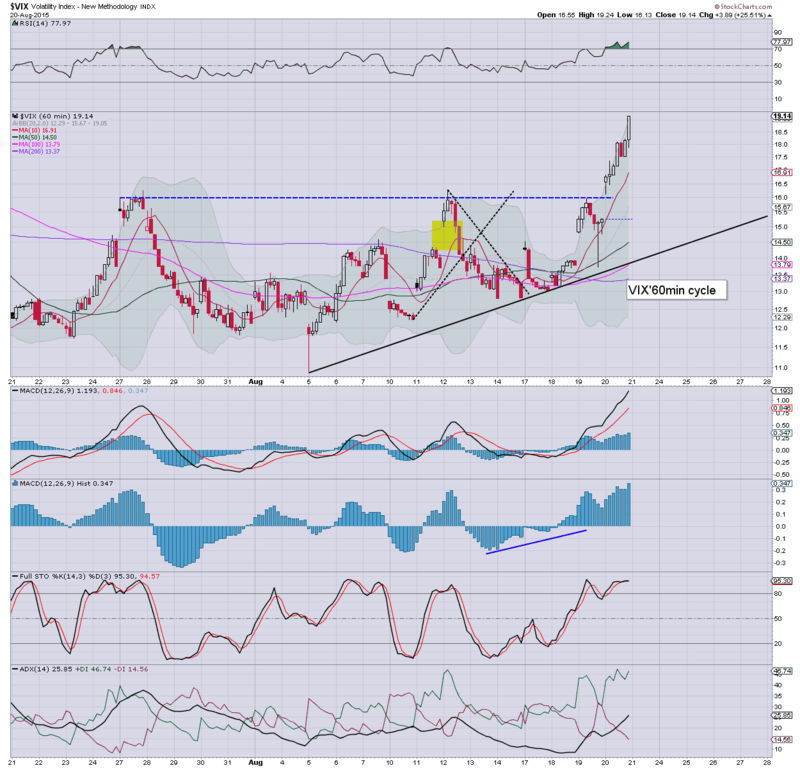 Gold is continuing to catch a significant 'fear bid', +$20 in the $1150s. So.. a marginal new low of sp'2042... and no doubt the cheerleaders on clown finance TV are about to have a valium drip installed. After all, we're now a full 3% from historic highs, and they will soon be screaming for Yellen to initiate QE4, along with reducing int' rates to below zero. An interesting day, but until the Dow loses 17000, its just that.. interesting. 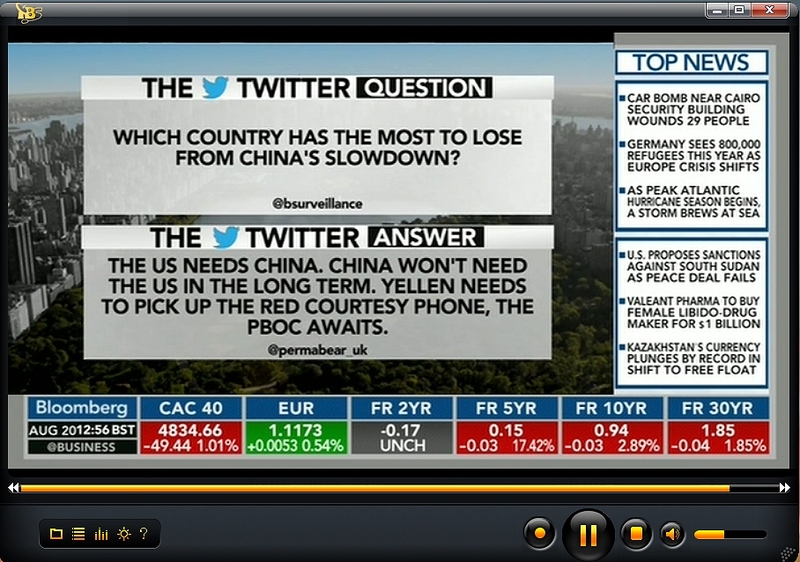 I'm tired, and will return at the close... unless Dow 17k fails... which I doubt. US equities are offering a provisional floor of sp'2046, with VIX 18.10. The Dow has got close enough to the 17000 threshold @ 17067, to merit an increasing probability that today was near term capitulation.. ahead of Friday opex. 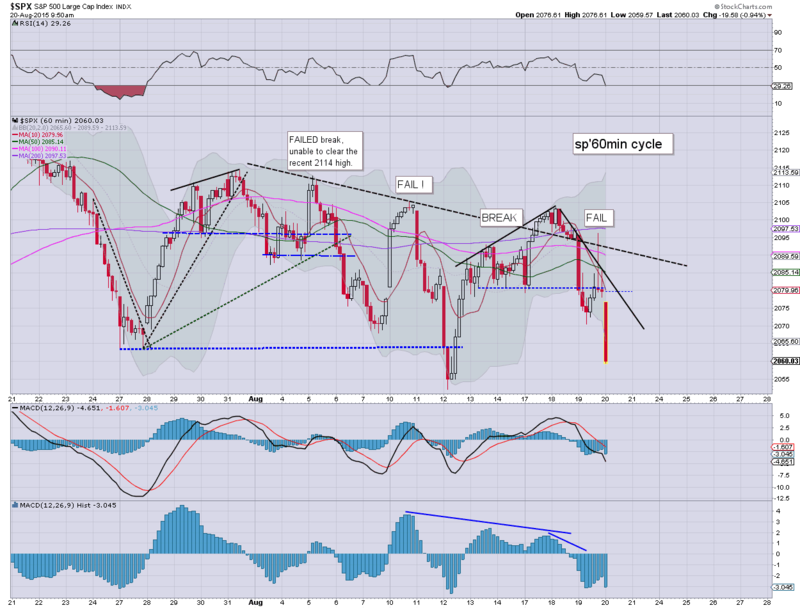 There is no clarity yet.. even on the smaller hourly cycle... but best guess is that we've floored.. in the target zone. I have ZERO interest in trying to trade an equity bounce into early next week. Instead, I am on the sidelines, and will endeavour to wait for a re-short next Mon/Tuesday, somewhere around the 2075/80 zone. As many of you are well aware.. I am usually one to re-short too early. So, if I'm hitting buttons next Mon/Tuesday, perhaps that means a better time is Wed/Thursday? The London skies are matching my mood today.. and certainly... of the broader capital markets. 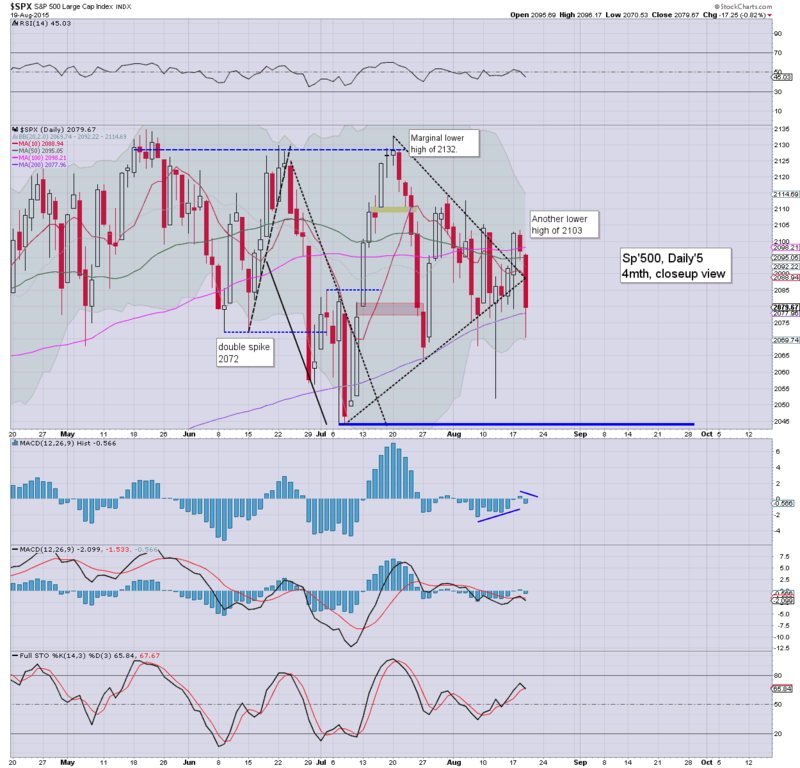 Whilst equities continue to battle to find a floor in the sp'2040s - with VIX 17/18s, the current weekly candle is confirming the original outlook that the market will see increasing weakness into September. 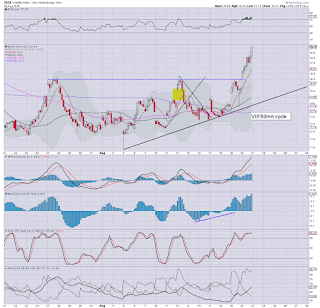 A break of the psy' level of sp'2000 now seems an absolute certainty within 1-2 weeks. 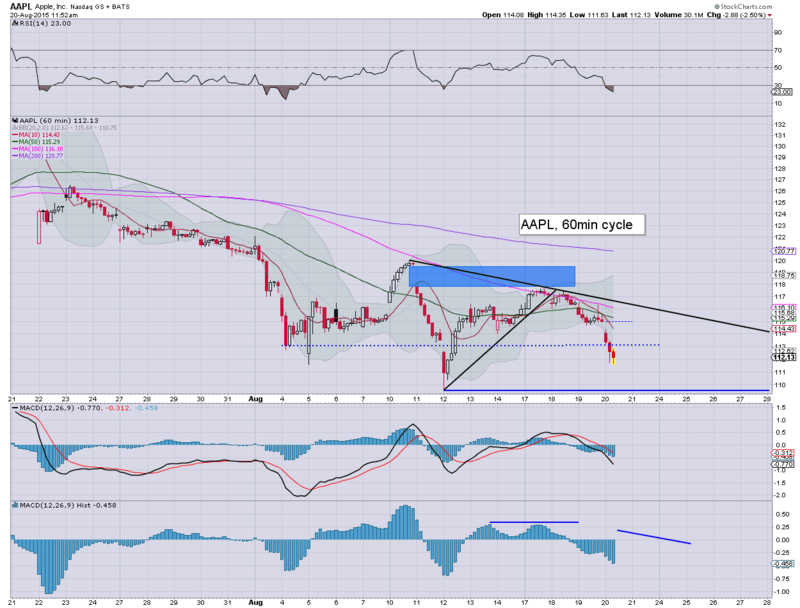 *the gap zone of sp'2076/79 is an obvious target in a bounce... and with the 200dma around 2078... that is now a prime target for next Mon/Tuesday. Regardless of how you might want to count this nonsense.. today feels like a pre-opex capitulation. Even if tomorrow sees another minor wave lower... Dow 17000 will likely hold... and then we claw higher for a few days next week. For now, I sure can't go long - despite an anticipated bounce. So... I'm stuck on the sidelines.. until next week. I suppose it could be worse... I could be long DIS. 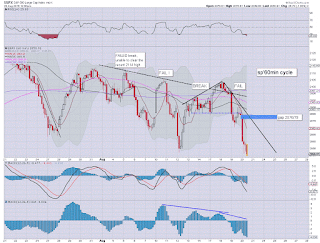 The sp'500 is offering a couple of candles with spikes.. and those usually bode for renewed upside. VIX has cooled a little, but still +12% in the 17.10s. It remains an increasingly messy situation, with threat of another wave lower to the sp'2040s - with Dow 17000... before greater opportunity of a bounce into next week. 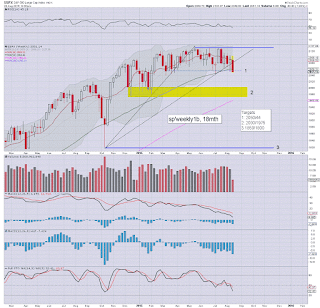 So... a bounce looks due... but we're not yet tested the sp'2040s... nor close enough to Dow 17000 to merit a solid floor. Maybe a bounce into the afternoon, and a final smaller wave lower tomorrow... with a turn on opex. As it is, I can't be shorting at these levels... nor with VIX 17s. I'm probably going to sit it out until next week. 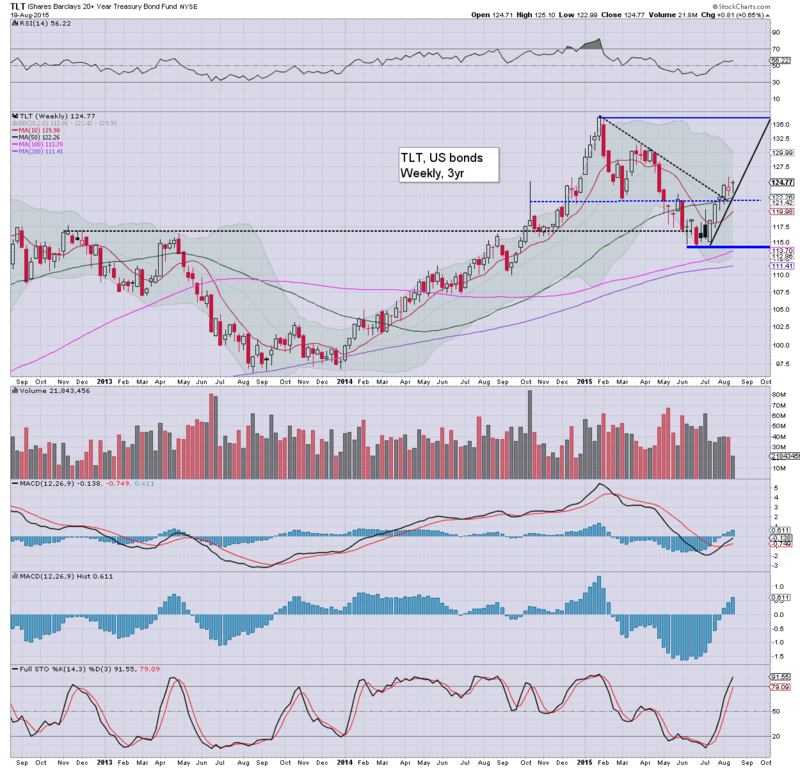 DIS, -4.9% in the $101s... the low 90s look due in September. 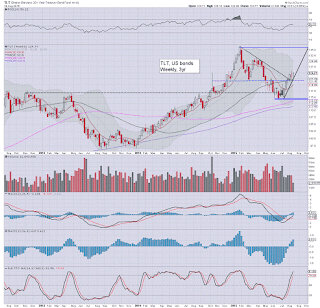 Broad downside target is $105... monthly cycle suggest $90.. and I realise the latter sounds like 'crazy talk' right now. US equities remain significantly weak, with a new intra low of sp'2051 - with VIX 17.35. Meanwhile, the Dow is fast approaching the key 17000 threshold... which will very likely hold. From there, a viable bounce to the 17400/600 zone. 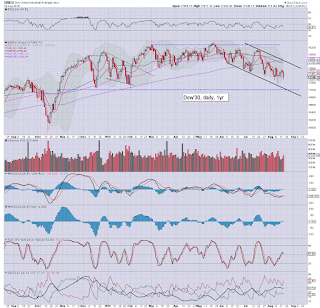 Any sustained action >17700 looks out of range for months. *my early exits in VIX/AAPL sure don't look good now. I'm clearly overly cautious.. .and impatient. Frankly, I'm starting to get real annoyed. 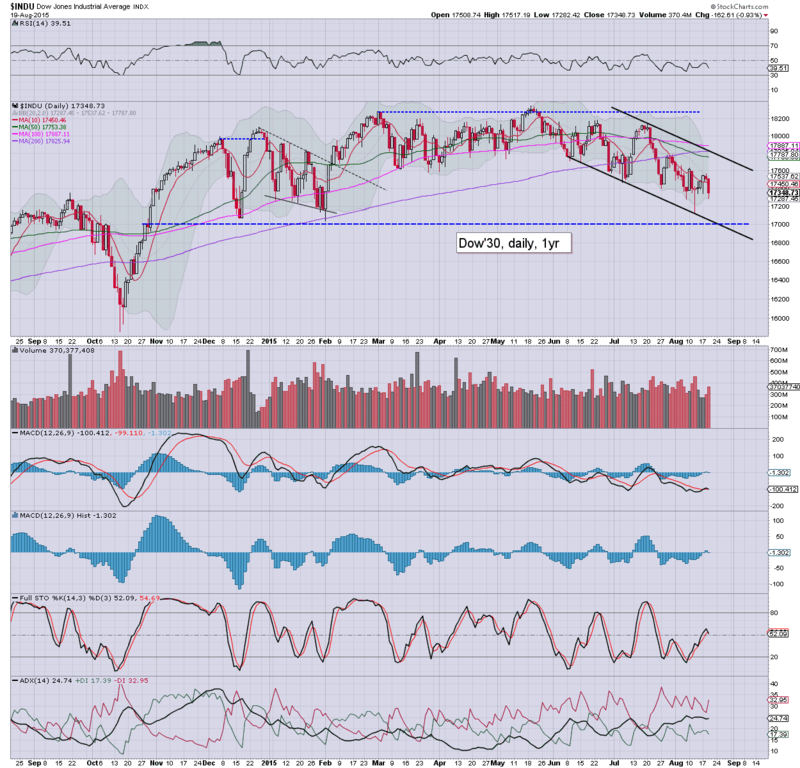 I don't expect Dow 17k to be broken in this cycle.... a bounce looks due, and that will likely take some days. Right now, I guess I will sit it out until next week. I sure can't go long VIX from the low 16s - whether late today or tomorrow.... its too high. and lately I can't seem to time a decent entry in VIX. Gods damn it... we may as well be Dow +300pts.... I'm getting tired of this. US equities open to an early low of sp'2059, with the VIX +9% in the 16.60s. It would seem that despite underlying weakness.. there remains a threat of the market clawing upward into the 2pm hour. Regardless.. all such bounces are to be treated as such. *I was stopped out of VIX from 16.60.. and AAPL from 113.80... frankly.. that is fine. Now I await (and will cheer) another dumb bounce into the afternoon. 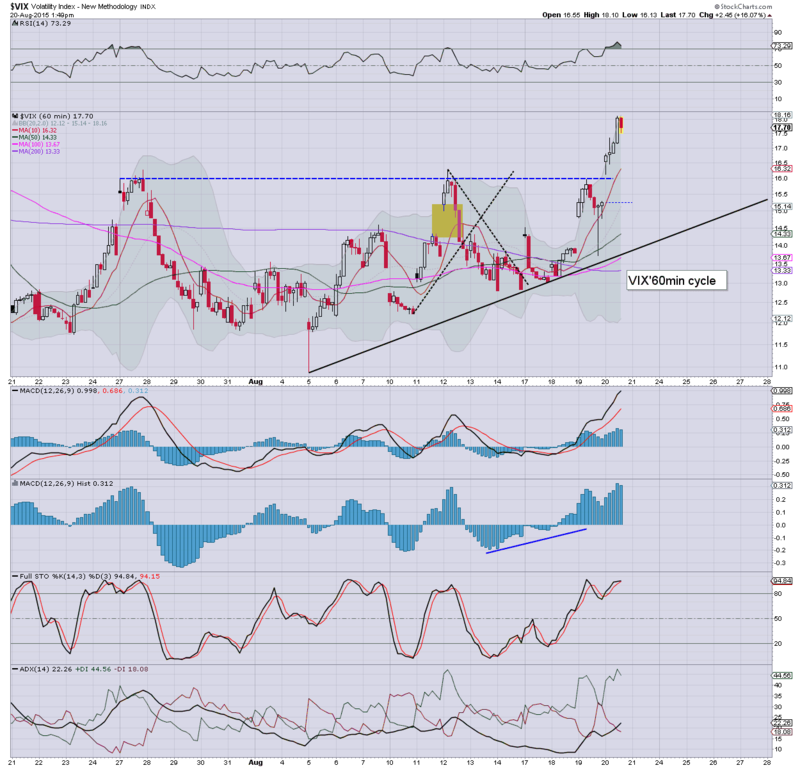 I will likely short it.. at least to some extent. So.. opening declines... but we're seeing some distinct signs that the market wants to rally. With opex tomorrow.. there will be some sig' threat of churn/moderate upside into the weekend. The bigger weekly/monthly cycles are very clear on where we are headed though. notable weakness: DIS -4.0% in the $102s... a full $20 lower since earnings. 10.02am leading indicators -0.2%... not exactly bullish. Phil' fed, existing home sales come in okay though. 10.08am. VIX 17.07.... micro 5/15min cycles are very close to maxing out. 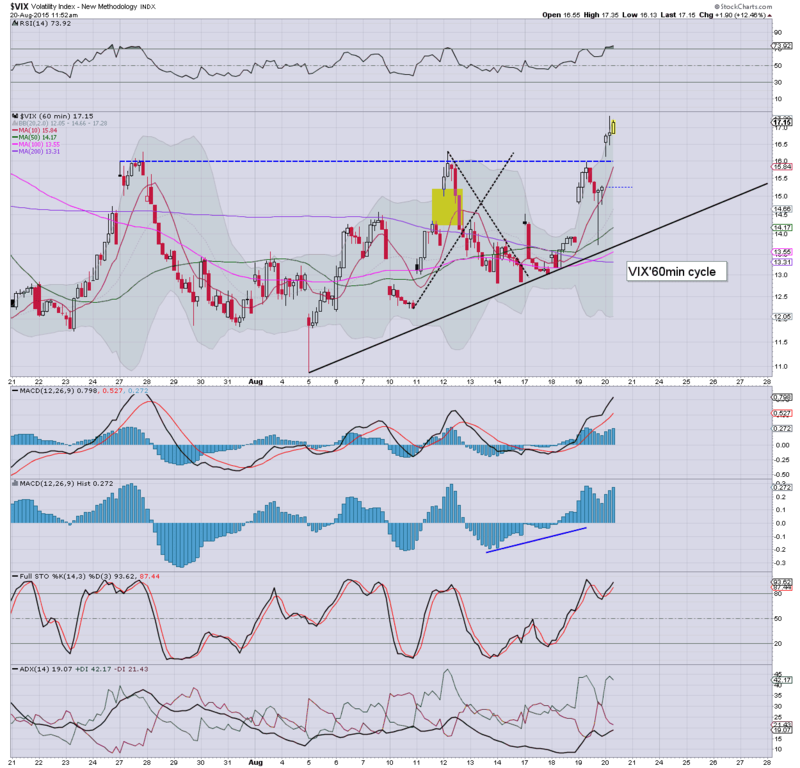 Right now, the 16.25/15.75 zone looks probable on any pull back. 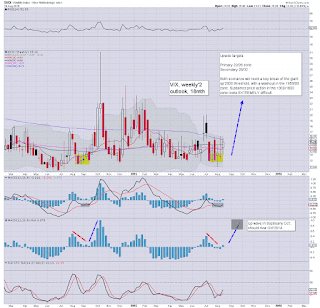 The real issue is whether VIX will cool into the Friday close.. or just keep on pushing. Lately, I've been overly early on buying back... this is a tricky situation. 10.22am... new lows sp'2053... and its starting to look like the key target of Dow 17000 and sp'2040s will be hit today... and then a multi-day bounce. If so.. 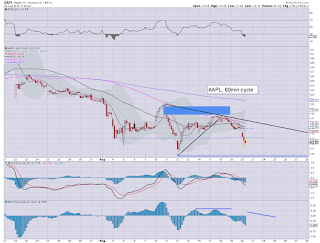 I won't get another chance to short this cycle... so... I'm now somewhat stuck. Ohh, and I sure won't attempt to trade the bounce. 10.25am... Pre-opex washout... Dow... another 50/100pts to go.... and that should be it. Good morning. Equity futures are sharply lower, sp -19pts, we're set to open around 2060... a mere 8pts above the Aug' 12th low. 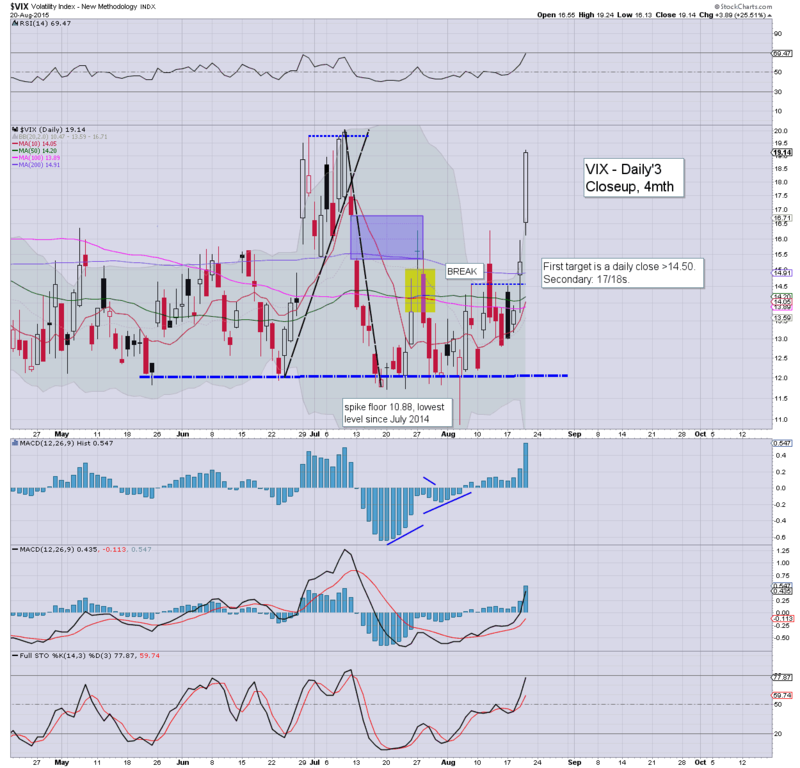 VIX is set to open in the 16.75/17.25 zone. 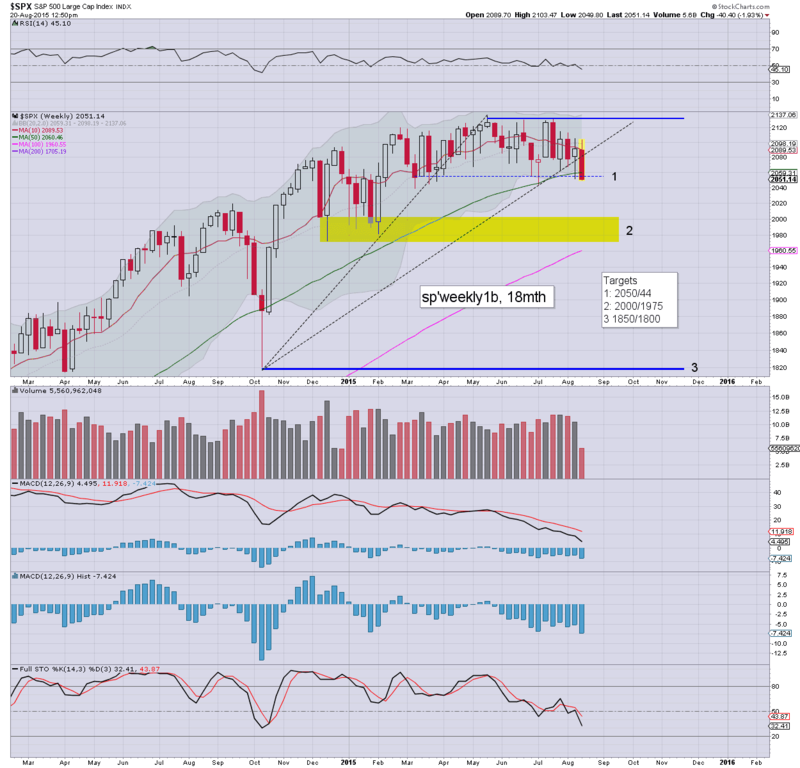 There will be strong support around the Dow 17000 threshold.. equiv' to sp'2040s. 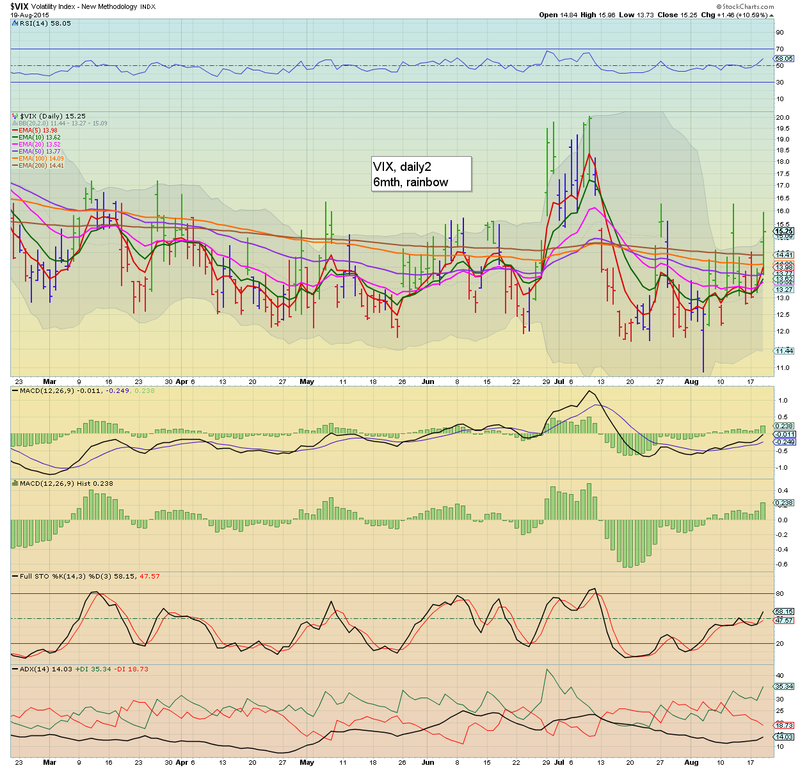 *note the EMAs crossing upward on the VIX daily chart. 17s look due this morning.... 18s would be a bonus. 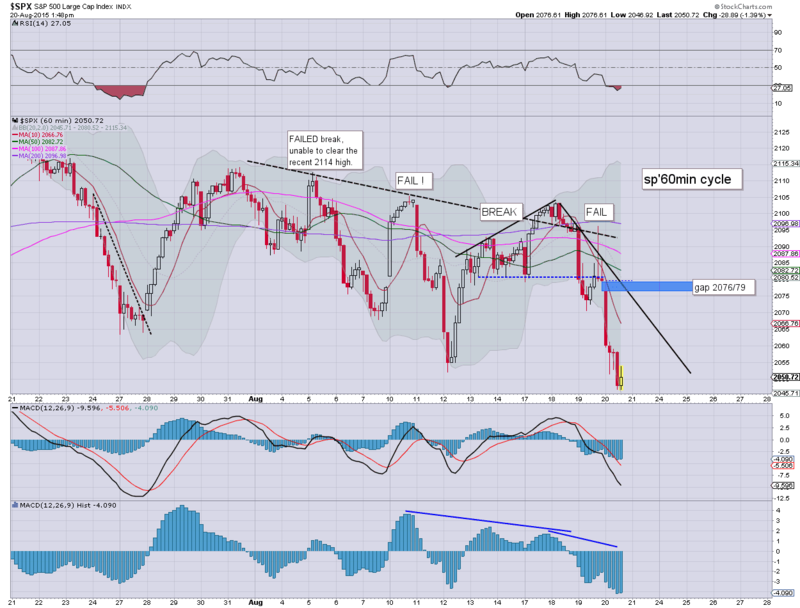 20s look out of range... even if sp'2040s. 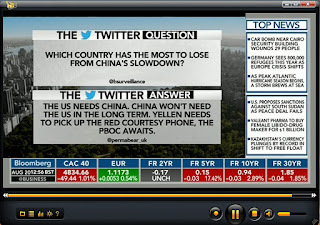 The market mood continues to deteriorate, with multiple negative pressures, Oil, int' rate concerns, currency moves, and underlying economic worries as commodities implode. As ever... there will be bounces along the way.. but we sure look headed broadly lower. Many are soon going to wake up and realise the sp'500 is going to lose the 2K threshold... and then the mainstream will panic. 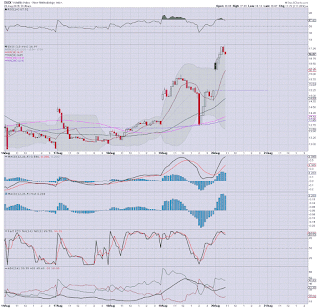 I will be watching the VIX very carefully at the open... not least for an opening black-fail candle. If so... I'll likely make a run for it... and merely re-short later. The point is... I'll try to trade in/out of VIX across the next 4-6 weeks, but will look to re-long on EVERY cooling phase... whether hours... or a few days. INTC, -0.9% in the $28.10s.... next target is 26/25s. 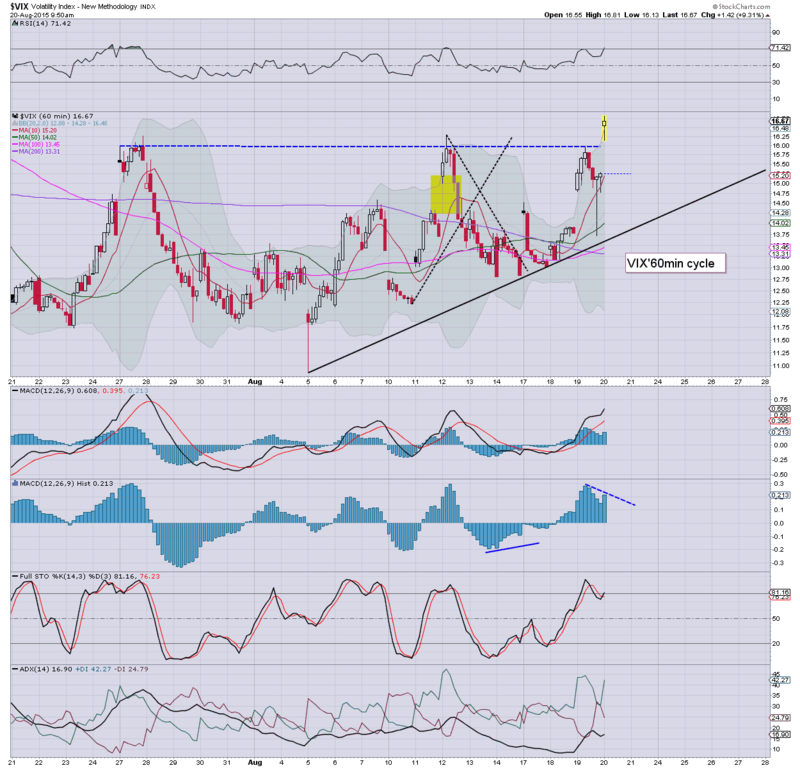 H/S scenario suggest $22s. VXX +4.8%... as the VIX is set to jump at the open. Overnight China action: The Shanghai comp' opened lower... a rally into the lunch break.. but then unraveled into the close, settling -3.4% @ 3664. The recent low of 3373 looks within range by end month... with broader downside to the 3200/3000 zone. 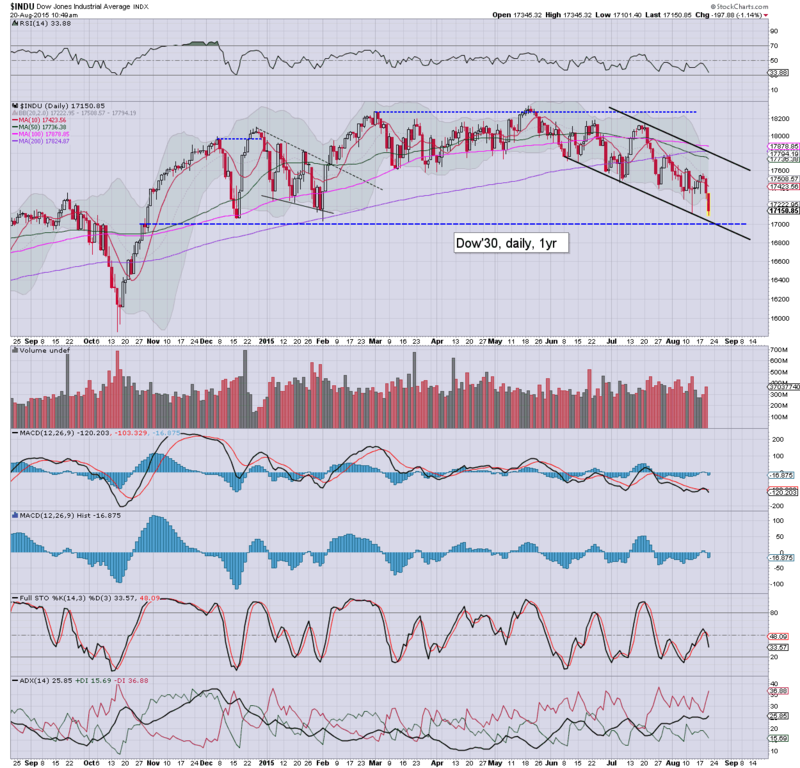 Worse case... 2500s... which would be an effective 50% crash from the June high. 8.00am.. sp -16pts.. . 2063 or so. 8.31am weekly jobs 277k... again.. inline. notable strength: TLT +0.5% in the $125.40s. 9.22am... chop chop... sp' -17pts .. 2063.. .... the 2050s look due.... but 2040s look tough. 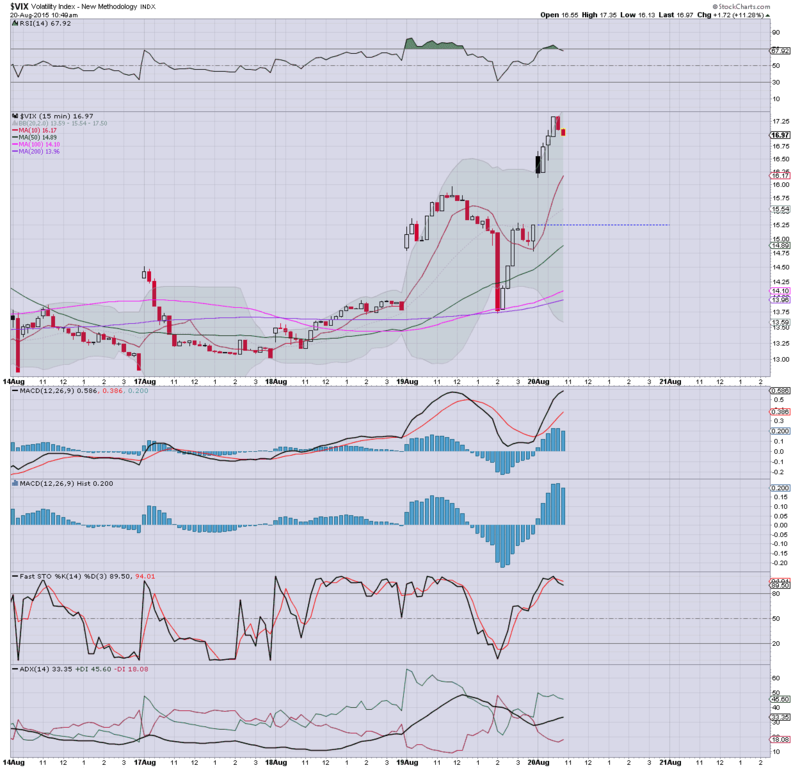 9.42am.. opening black-fail candle on the VIX..... bears beware. It was a pretty exciting ride in the market today, with the sp' falling to sp'2070.. a crazy bounce to 2096... and settling -17pts @ 2079. The setup for the equity bears is increasingly good, with the VIX finally able to hold above old resistance, and US bonds pushing back upward. It has been a somewhat tiring day.. so this will be short. 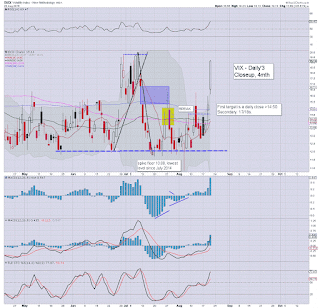 The VIX has finally managed a daily close decisively above old resistance of the mid 14s. The 17/18s look due in the near term. 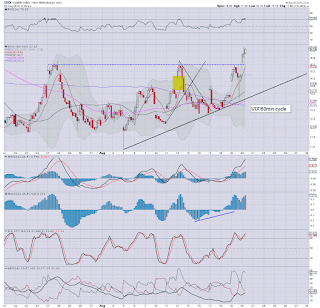 TLT - US bonds are continuing to broadly rise, and that is certainly one valid bearish equity signal. The 126s look a valid target in the near term. 130s in September. 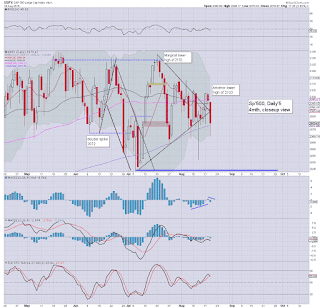 The sp'500 is flashing a red candle this week, a break to the 2050/40s looks due by end month. 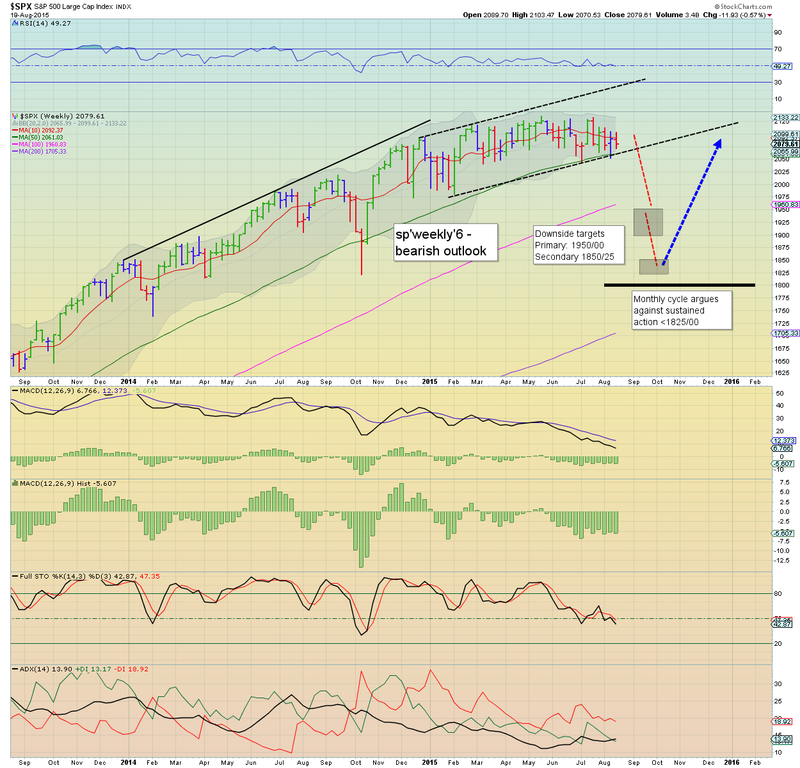 More severe downside looks due in September, as the sp'500 looks set to lose the giant psy' level of 2000. Thursday will see the usual jobs, phil fed', existing home sales, and leading indicators. It was a day of rather wild swings for US equities, with the sp' -17pts @ 2079 (intra high 2096, low 2070). The two leaders - Trans/R2K, settled lower by -0.7% and -1.0% respectively. 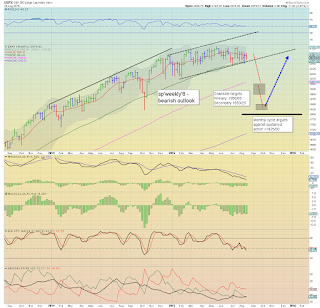 Near term outlook is for the sp'2050/40s, with Dow 17000, and that should equate to VIX 17/18s. A wild day for stocks... early weakness, a bounce into the afternoon.. but then renewed weakness into the close. The sp'2100 threshold still looks possible for Friday opex, but regardless of the rest of this week... broad.. and increasing downside into end August.. and across September. 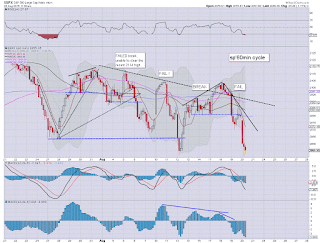 This market looks increasingly weak.. as especially reflected on the bigger weekly/monthly cycles.